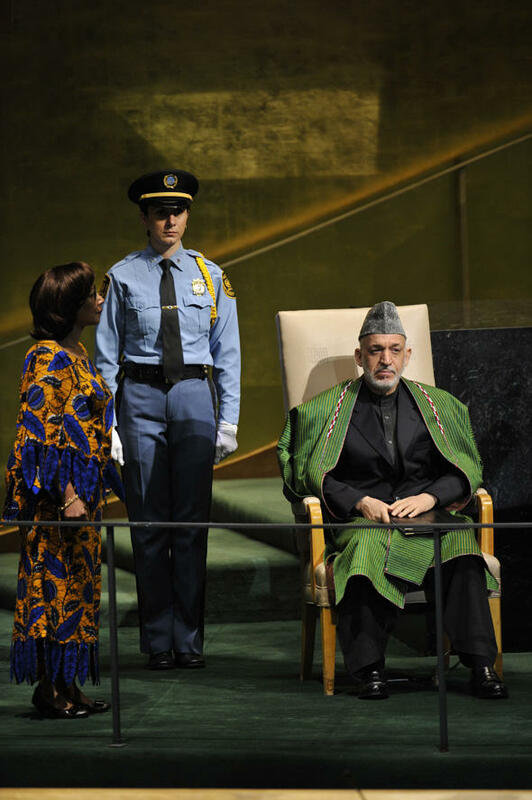 Afghan President Hamid Karzai at the United Nations General Assembly. COURTESY OF THE AFGHAN MISSION TO THE U.N.
Afghan President Hamid Karzai has asked the United Nations to assist in peace negotiations with the Taliban, which so far have not borne results. “To help facilitate the peace process, I ask of the United Nations Security Council to extend its full support to our efforts,” Karzai said. “In particular, I urge the 1988 Taliban’s Sanctions Committee to take more active measures towards delisting of Taliban leaders as a step to facilitate direct negotiations. Karzai also condemned depictions of the Prophet Mohammad that have been deemed offensive by Muslims. Read President Karzai’s entire remarks below.